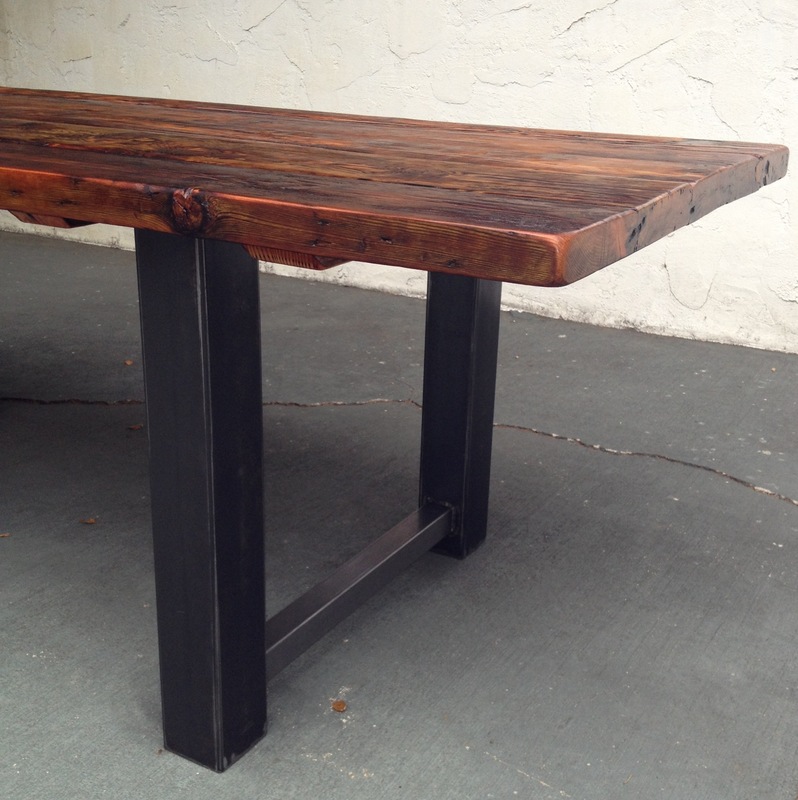 This dining table was handcrafted out of reclaimed wood and raw steel. The textures give this table a warm and natural feel. The materials give it a sophisticated and modern look. Sizes and colors are custom. Hello, do you do custom tables? If so how much would a table be 200 x 100cm? Thanks! would love to get a quote on a table like this that would seat six possibly expand to 8 – not sure what size that would be. Could you give me a quote. Like others, I would love to get a quote on a table like this. I would like something that seats 6 comfortably with the option to seat up to 8 (using a matching bench on one side). But for now I would need the distance between the table legs to accommodate two side chairs that are 24.5″ wide, and the overhang on the ends to allow for someone to be seated comfortably without banging their knees on the table legs. What size table would that be and what is the cost? And, can you also create a matching bench to go with the table? Thanks! Hi Christy, I have replied with an email, thank you so much for your interest! hi wondering if i can get a quote on a six foot table like the one pictured. thanks. Hi Krystan, I have sent you a reply via email. Thank you for your interest! Hi i would like a quote on the table pictured! We are looking for a table just like this that will seat 8 people comfortably. What would a quote be for that size? I would like a quote for a this table, to sit 8 (maybe 84″?) When you reply, Could you please include options for delivery costs. Thank you! looking for a quote on a similar table with wood base comfortably seating 8 (approx 84″) x 40″ with one matching bench. Love this table! I’m looking for one that is approx 84 x 38 with one or maybe two matching benches. Please send me a quote – thanks! Great design! Looking for a quote for a table that seats 6 (36×72?). Also, are the legs recessed in enough to fully slide a chair under the table at the ends? The cross supports at the bottom seem like they may get in the way. Again, beautiful work. Thanks so much. Can I get a quote on this table but custom finish. Like a gray stain? Hello – love the Table pictured. Two questions: #1: How much would this be in a 8′ or 9′ version (30-36″ wide). #2: do you have alternatives with wooden legs? I would like a price on 6ft table. I love the table. Please provide quote for 30″ x 60″ dining table. Do you ship internationally? I live in France. Can I get a quote on a 7 ft table?? Can you give me a quote on a table just like this that is 8 feet long? Would love a quote for a 6ft table. Thanks! I am intrested in the cost of a table about 48″ x 28″ as well as two benches to go with it. Thank you! Hi Vicki, I’ll get a personal email out to you soon with a quote. Took this post from someone else as it perfectly describes my desire! Hi, like everyone else, I’m loving the flavor of this reclaimed wood table. 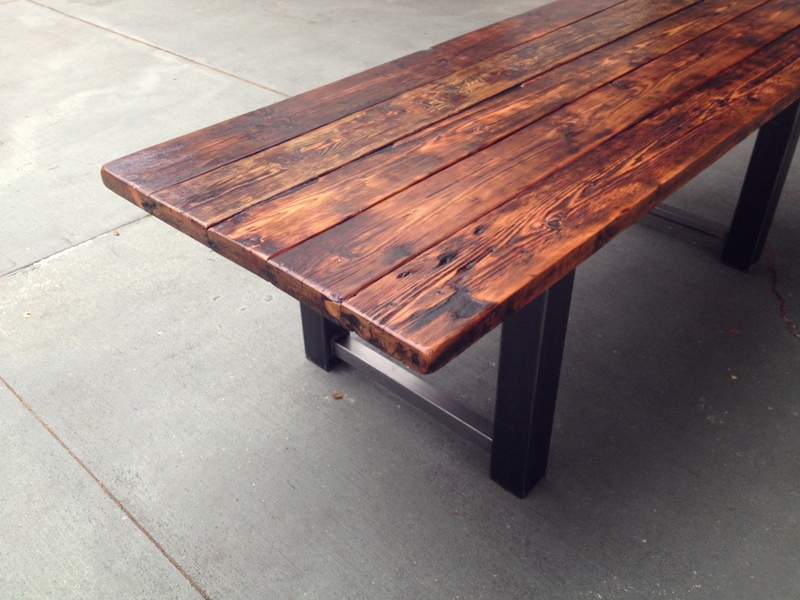 I’m interested in getting a quote for a reclaimed wood dining table that seats 6. I need the height to be 31 or 32 inches high. Could you provide me with a quote along with how many weeks it takes to complete and ship? Would Lik to get a quote for this type dining table along with 8 seaters. We are located in India … Thank u n advance. Hi Kelly, Thank you for your interest. I’ve sent you a quote to your WP email. -CC. 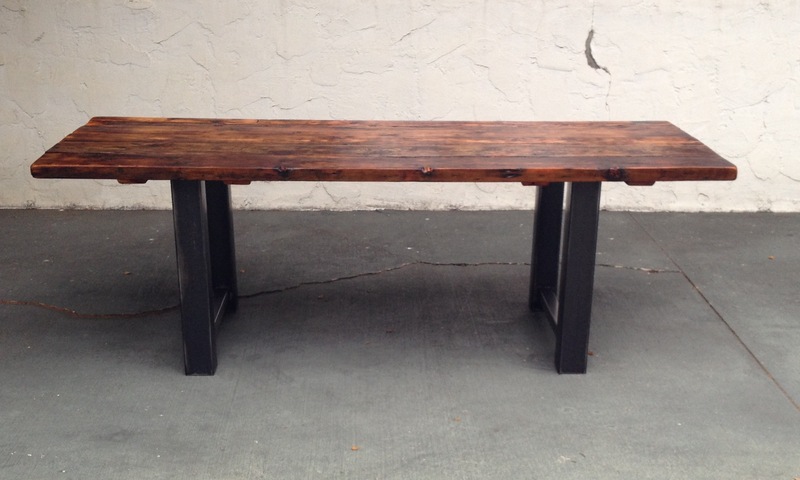 Could I get a quote on the reclaimed wood and steel dining table (with shipping)? I’m going to use it as a desk and need it 7 feet long x 27″ deep x 29″ high. We are interested in a 8 seater table with room for 3 people each side and one chair on each end. Cost? We would like a quote for a similar table large enough to fit 10-12. 4 on each side and 2 on each end. Could you send us a quote. Looking for weathered wood boards with white square legs on the corner. Is this something you could do?